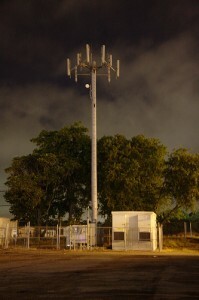 When T-Mobile sought to place a cell tower in a park owned by the City of Huntington Beach, California, the City granted the company all the regulatory approvals it required. But the City also informed T-Mobile that before it would finally lease the company the rights to the City property that it needed, the company must first obtain approval from City voters, under an amendment to the City charter known as Measure C.
T-Mobile refused. It claimed that Section 332(c)(7) of the Communications Act, 47 U.S.C. § 332(c)(7), preempts this City requirement. Not according to the Ninth Circuit, which decided Omnipoint Communications, Inc. v. City of Huntington Beach, No. 10-56877 (9th Cir. Dec. 11, 2013) last week. The court ruled that because Section 332(c)(7) “applies only to local zoning and land use decisions and does not address a municipality’s property rights as a landowner,” it does not preempt this local requirement, which concerns only how the City may lease its property. No . . . structure costing more than $100,000.00 may be built on or in any park or beach or portion thereof . . . unless authorized by the affirmative votes of at least a majority of the total membership of the City Council and by the affirmative vote of at least a majority of the electors voting on such proposition at a general or special election at which such proposition is submitted. [A] building permit does not give a builder the authority to begin construction on property belonging to a third party; rather, the builder must secure the third party’s permission. Here, the City’s authority to give such permission via the Site License Agreement was limited by Measure C.
Does not require voters to apply any particular regulatory criteria. Image courtesy of Flickr by Steve Rainwater (creative commons license, not modified).